Chris Giovinazzo represents plaintiffs and defendants in complex litigation and business disputes. He has extensive experience with litigation in the health care industry, intellectual property and environmental litigation, and employment and professional liability disputes. Represented international medical products developer in patent lawsuit, successfully protecting patents on a novel filtration device. Successfully defended plastics/medical products manufacturing company and senior executives against claims of trade secrets misappropriation and breach of confidentiality. Appellate counsel to nursing home operator in breach-of-contract case, successfully overturning $12 million judgment. Represented Fortune-50 health care provider in defense of major False Claims Act/whistleblower lawsuit. 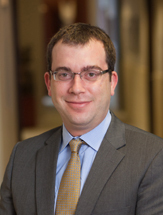 Chris has defended law firms and accounting firms in high-stakes professional liability litigation. Most recently, Chris defended a major Atlanta law firm in a malpractice action alleging damages over $100 million. Chris was responsible for the Daubert motion that led to the exclusion of the majority of plaintiff’s damages expert analysis, facilitating a favorable resolution of the dispute. Litigated before the Georgia Public Service Commission and the Georgia Supreme Court in support of citizens groups challenging Georgia Power Company’s process for selecting sites for electrical substations. Represented a class of approximately 2000 property owners in a nuisance and trespass action against an animal waste facility, a case involving the U.S. E.P.A., Georgia Department of Agriculture and Georgia Environmental Protection Division. Chris advises employees and employers in severance and intellectual property disputes, including in litigation of non-compete agreements, non-disclosure agreements, trade secrets and discrimination claims. Represented senior leader of a state university in wrongful termination case under Georgia’s Whistleblower Statute. Secured a settlement with the Board of Regents of the University System of Georgia providing our client with all relief available under the statute, including all lost wages plus all attorneys’ fees. Represented finance executive in successfully voiding non-compete terms in an employment agreement. Successfully defended against multi-million dollar claims for unpaid commissions by former sales rep of foreign exchange trading company. California’s Global Warming Bill: Will Fuel Economy Preemption Curb California’s Air Pollution Leadership?